The sky at the top end is big and the weather moves like a living thing. You can hear it in the cracking air when there is an electrical storm and as the thunder rolls around the sky…When Cyclone Tracy swept down on Darwin at Christmas 1974, the weather became not just a living thing but a killer. Tracy destroyed an entire city, left seventy-one people dead and ripped the heart out of Australia’s season of goodwill. For the fortieth anniversary of the nation’s most iconic natural disaster, Sophie Cunningham has gone back to the eyewitness accounts of those who lived through the devastation-and those who faced the heartbreaking clean-up and the back-breaking rebuilding. From the quiet stirring of the service-station bunting that heralded the catastrophe to the wholesale slaughter of the dogs that followed it, Cunningham brings to the tale a novelist’s eye for detail and an exhilarating narrative drive. And a sober appraisal of what Tracy means to us now, as we face more-and more destructive-extreme weather with every year that passes. Compulsively readable and undeniably moving, Warning is the essential non-fiction book of 2014. 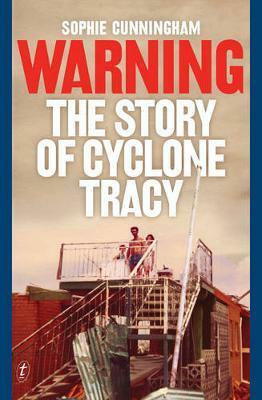 It’s almost 40 years since Cyclone Tracy destroyed the northern city of Darwin on the night of 24 December, 1974. Australia had not known a natural disaster like it since European colonisation. Seventy-five people died, hundreds more were injured and 12,000 homes were destroyed or made totally uninhabitable. Most public buildings were flattened or seriously damaged. Thirty thousand of the city’s population of 47,000 were airlifted from the city in the days after, in what was to become Australia’s largest evacuation effort. Many of those people never returned. With a forensic eye and a novelist’s sensibility, Sophie Cunningham takes us through the cyclone and the days and weeks immediately afterwards. It is hard to imagine what it must have been like to endure the cyclone, with winds reaching 300 kilometres an hour, destroying homes while the inhabitants attempted to take shelter inside. One woman in Cunningham’s book describes being sucked from her house with her baby in her arms, only to be hit by a torrent of water as her above ground swimming pool burst open. How do people and a community cope with this kind of traumatic experience? With great difficulty, but also with great stoicism and courage. The strength and beauty of this book is the way it delves into the lives of the people affected and tries to understand their responses, their courage and their failings. Cunningham argues that these kinds of natural disasters are going to become more prevalent as the effects of climate change make extreme weather conditions more likely. This book is no polemic: it’s a gripping and visceral tale.